The long-running Alameda restaurant offers a variety of Hong Kong- and Cantonese-style dishes to please every palate. Nearly every dish served during dim sum is a crowd-pleaser. A gaggle of twentysomethings examine the dumpling cart's offerings, each little metal container releasing a chimney of steam as the cart lady opens it for display. Meanwhile, an elderly couple picks out a plate of steamed rice noodle rolls from another cart. The cart is out of shrimp rolls, their favorite — but no need to settle for less. The cart lady calls in their order by speaking into the mouthpiece of her headset. In a few minutes, an order of rice noodles, stuffed with shrimp and topped with sweet soy sauce, fresh out of the kitchen, arrives to their table. Welcome to East Ocean Seafood Restaurant, located on Webster Street in Alameda's West End since 1995. There are easily over 200 people here at a time for dim sum on the weekends, but there's no need to jump out of your seat to fight over the last plate of baked custard buns (although those custard buns are certainly worth fighting over). Instead, yum cha (Cantonese for the act of going out for dim sum) is an enjoyable, relaxing, and most importantly, delicious experience. The Hong Kong-trained chefs start making dim sum fresh every morning at 5 a.m. and don't stop until dim sum service ends at 2:30 in the afternoon. Most of the wait staff has worked here for over 20 years. The restaurant runs like a well-oiled machine, and Millie Low is at the helm. Low and her three older sisters have worked at East Ocean since the restaurant opened its original location in Oakland Chinatown in 1983. Their mother, who worked in a sewing factory, started the restaurant out of her "strong will to not want to be a housewife, but to be a business person," Low said. But it wasn't easy being a restaurant owner in Oakland Chinatown back then. "It was a male-dominated industry," Low recalled. Some meat suppliers would try to overcharge her because she was a woman, but her mother insisted on a fair price. Low said some men would tell her mother, "'You worked in a sewing factory, all you know is clothing.' She said, 'No. I know food, too. I eat every day.'" Low said her mother helped East Ocean stand out from its competition with her attentive and caring customer service. "My mom was different. She cared about the customers." Low never planned on taking over the restaurant. But when her mother fell ill and eventually died, Low and her sisters took over East Ocean at its current location in Alameda, using the customer service skills they learned from their mother. "Even if something was wrong with a dish, she would have a great smile, say, 'OK,' and try to fix it," Low said. That said, nearly every dish served during dim sum is a crowd-pleaser. It just wouldn't be dim sum without har gow and siu mai, and East Ocean does the two popular dim sum favorites well. The har gaw rice wrappers are perfectly chewy, and made in-house every day. Inside, generous chunks of fresh shrimp create a satisfying crunch. Try dipping them in the garlic chili paste, which sits in a jar on the table. The bite-size siu mai are juicy but not greasy, and nearly everyone goes back for seconds. The Cantonese- and Hong Kong-style dishes are East Ocean's specialty, so stick with those. If you're craving potstickers or xiao long bao (Shanghai dumplings), there are better versions available elsewhere. The fried dim sum, however, is a must-order. The best is the ham sui gok, a deep fried meat dumpling — egg-shaped and fried to a deep golden brown, made with a mildly sweet, thick glutinous rice skin and stuffed with a filling of ground pork and shiitake mushrooms. It's the perfect harmony of sweet and salty, crunchy and chewy, meaty and earthy. A close runner-up is the fried taro dumpling, which has the same filling enclosed within mashed purple taro, breaded and fried until the crust resembles a delicate lace. Even the kitchen items here are excellent. There are some homestyle Cantonese options, like pig's feet cooked in black vinegar and ginger, and chicken feet in a spicy black bean sauce. The salt and pepper fried calamari is lightly battered and perfectly seasoned, and every bite, down to the tiny squid legs, is bouncy and crispy. Another unusual option is the XO noodle rolls. Here, sheets of rice noodles are rolled up into tight cylinders and cut into pieces measuring a couple inches long. They're flavored with XO sauce — a Hong Kong-style sauce made with dried shrimp, dried scallops, and chili peppers — then stir-fried until every noodle is kissed with a bit of dark color and smoky flavor from the wok. The baked custard buns are a stand-out dessert. They have what's called a "pineapple" top, which doesn't contain any pineapple at all — it's a crust of butter, sugar, flour, and egg that cracks when it's baked, resembling the outside of a pineapple. The crust is crumbly and rich, while the hot egg custard inside smells so strongly of vanilla that it almost tastes like it's spiked with rum. 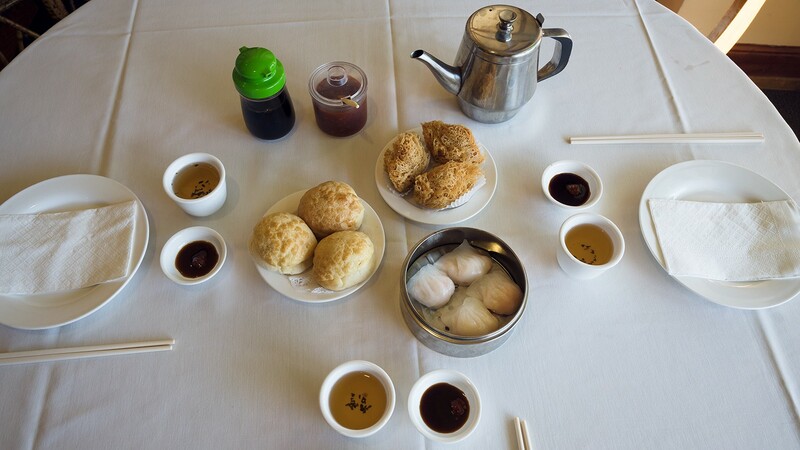 Many customers know East Ocean as "that dim sum place in Alameda," but the restaurant also offers elegant dinner fare. Families gather at East Ocean to celebrate birthdays, holidays, red egg parties, and weddings. Nearly every banquet table has an order of the smoked black cod. It's a delicacy of oily, flaky fish marinated in sweet, red cha siu sauce and baked until the edges are lightly charred. Another popular choice is a whole fish such as black bass or rock cod, plucked live from the tank and steamed to order with green onions, soy sauce, and ginger. It's served head-on, so be sure to scoop out and eat the cheeks — they're the most tender part of the fish. There's also fresh lobster, served shell-on and lightly fried with ginger and green onion sauce. It's off-menu, but diners can also ask for the lobster to be served over a pile of thick, chewy wheat noodles called yi mein. Hours: Mon.-Sun. 10:00 a.m.-2:30 p.m., 5:00 p.m.-9:30 p.m.